The elusive and enigmatic Shadowkeep, by Trillium. A bit of a change of pace for this particular company, who had concentrated exclusively on text-and-graphic adventures up to this point. Shadowkeep has more of an RPG flavor. The apparent scarcity of this one amazes me. I've only seen it in the Trillium folder, never in a package with the Telarium name, nor in the European ASL plastic case. 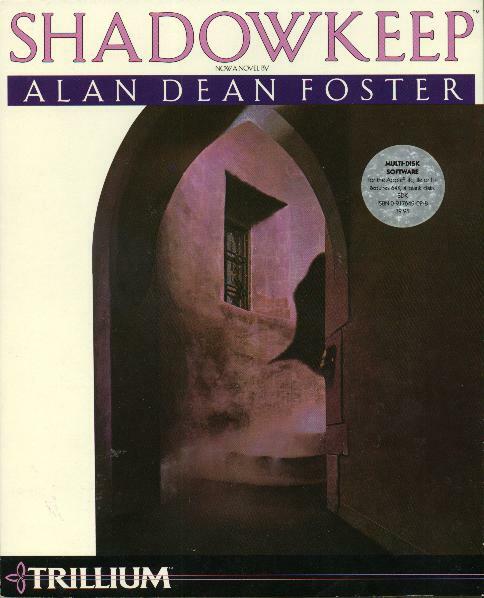 Apparently Telarium never reissued it, which is hard to understand when you consider that author Alan Dean Foster wrote an entire novel to go along with the game. The novel actually seems to be easier to find than the game itself. But as difficult as this Apple II package was to locate, nothing compares to a PC version.